Scholl Canyon Golf Club in Glendale, Ca. is considered one of the best executive courses in the country. The course provides great Glendale golf deals on a top notch course. The course is located at the top of the Verdugo Mountain Range, about 8 miles from the Rose Bowl in Pasadena, Ca. 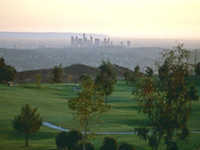 This golfing facility has wonderful views of the Los Angeles basin and Pacific Ocean. The Scholl Canyon Golf Club was designed by William Bell and was opened in 1994. This 18 hole course (par 60) measures 3,039 yards from the back tees. The course has a rating of 54.8 with a slope of 88 on Bermuda grass fairways and bent grass greens. The course is tricky due to the mountain terrain. The fairways slope uphill or downhill with strategically placed hazards, blind shots and shots over canyon. The greens have medium slopes and are fast. When making your Glendale tee times, you can take advantage of Scholl Canyon Golf Club discounts offered on a daily basis. Reservations may be handled online or through the course starter. Amenities include a driving range, putting green, pro shop, cart and club rentals, banquet area and dining facility.